Free Agent Watch: Could The Hawks Consider DiPauli? While the Blackhawks talk to the most coveted free agent on the market – Harvard’s Jimmy Vesey – another college free agent might be on their minds as well. Thomas DiPauli, from suburban Woodridge, spent the last four years at Notre Dame after being selected in the fourth round (100th overall) of the 2012 NHL Draft by the Washington Capitals. He led Notre Dame with 14 goals and posted a collegiate career-high 32 points for the Fighting Irish last season. 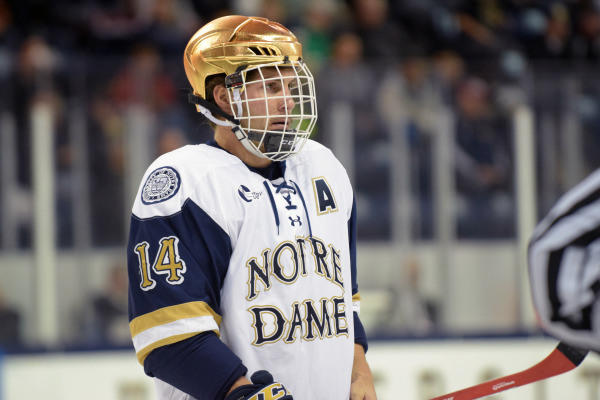 DiPauli was an alternate captain for the Irish his senior year and was named the team’s Offensive MVP. He also earned Honorable Mention Hockey East All-Star honors in his final college season. The Hawks shouldn’t have to work very hard to determine if they’re interested in the 5-11, 197-pound center. DiPauli’s four year career in South Bend overlapped with Blackhawks draft picks Stephen Johns, Vince Hinostroza and Dennis Gilbert. Also, he was at the US National Development Team before matriculating to Notre Dame. In his final season in the program (2011-12), DiPauli skated on a roster with Blackhawks prospects Ryan Hartman, Tyler Motte and John Hayden – all three of whom were drafted by the Hawks in 2013. Like Vesey, he did not sign and became an unrestricted free agent on Aug. 16. DiPauli also shares an agent with Vesey. While DiPauli wouldn’t be considered a near-lock for the NHL roster in 2016-17, he was a strong leader at Notre Dame and might be a player the Hawks consider for organizational depth. I think there is a lot of Domino’s to fall when Vesey finally decides. All the other college free agents looking for a tryout. Hudler, Fleishman, and others still looking for jobs. 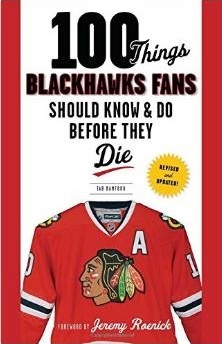 Rockford depth is going to be an issue if we have a number of kids (forwards) in the line up this fall. Lots of “D” not much up front. Fwiw, I brought this up a week or so ago. My “Troll” radar us made a detection. Criticism is welcome, debating is good…personal attacks no way. Geez I hate the Penguins.